Men of Machiavellian nature have always been in and around the sport, controlling it like an iron fist in a velvet glove. While making it appear glamorous and alluring in its presentation, they were controlling its visceral workings with an ardour and obdurateness rarely seen in other sports. At its peak, a cloud of secrecy might have occurred during most dealings, but everyone associated with the sport knew about them. Boxers at times were like puppets on a string, just obeying what these gangsters told them to do. If boxers managed to break free from these strings and become independent, chances are they would be blacklisted. And to break the act of omerta and state how the mafia controlled the sport to law enforcement, just would not be salubrious to a boxer’s career. Yet like most empires, the mafia’s grasp on boxing evaporated far quicker than it took to build. The American government and in particular Senator Kefauver, reduce the length of the underworld’s tentacles and boxing became the beneficiary. 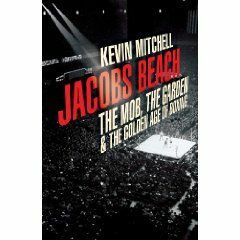 This book by Kevin Mitchell (published by Yellow Jersey Press) chronicles the history of the mob’s influence within the sport, describing how men like Frankie Carbo and Jim Norris impacted on the sport. Mitchell also states what happened to the sport after the International Boxing Club was disbanded. He explains how certain promoters and from the late sixties onwards came to the forefront of the sport and whose dealings, while not Mafia connected, certainly had elements of that way of doing things. The book is well written and very detailed in describing that period in the sport. It explains all of the main players in that time and what specificity their roles were. Mitchell portrays the position of Estes Kefauver with greater depth than he has possible been talked about before. There are first hand accounts from promoters, trainers and cut men amongst others who were around at the time. Like the rest of the book, these accounts are detailed and well structured. If there are grips with the book, it is that the flow between the depiction of the fifties boxing scene and the personal accounts is poor. Also the accounts tend to be a little one sided, referring boxing from a bygone age as the good old days. However overall it is an engaging read. It has been nominated for the William Hill Sports Book of the Year Award and it is easy to see why.